In addition to tablets of all shapes and sizes, Toshiba makes device components too, you know. Today, for example, the company announced the latest CMOS camera sensor that it has developed, and on paper, it seems like a promising piece of silicon. Toshiba's new camera sensor offers 13 megapixels of resolution, but that's not what makes it special. It stands out with being made using 1.12 micron pixels, which results in a footprint of only 8.5 square millimeters. Now, when pixel size goes down, image quality deteriorates, but Toshiba says it has addressed the issue with integrated color noise reduction technology. Furthermore, the sensor is of the backside-illuminated kind, so in theory, it should perform well even in low-light conditions. 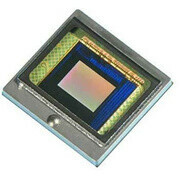 We'll have to wait, however, until we get to see this 13MP Toshiba CMOS sensor in action. Interested manufacturers will be able to request samples no sooner than December, 2012, so it likely won't show up inside a gadget before H2 of next year. So, I guess we may see this on the HTC One X+++, or the SGSV, right? Well, we'll se how it performs... every time a new sensor is released, the manufacturer claims that it has amazing new technologies, but the truth, afterm many years, is that the smaller the sensor is the more image quality deteriorates. Let's see.... Magic 8 Ball just answered my question about what flagship phone for 2013 will look like spec-wise: S4 Pro + Adreno 320 2 Gb RAM Min of 16 Gb memory with removable storage 5 inch (or larger) 1080p display Removable 3000 mAh battery 13 Mpixel camera LTE radio I bet this is what the GS IV looks like. well, Toshiba's camera will not be on it for a while - SGS4 comes out around april next year and this better camera tech will not be avail until last half of 2013. It kind of depends on product release schedule. July/August might get the new camera. I wonder how quickly Toshiba can ramp production? Besides battery life, camera tech is the next biggest stale point in smartphones IMO. What about the 808 or 920 or 2 year old N8 or the time shift or something like that feature in BB10? There are advances but they're not becoming mainstream. I had the Droid Incredible forever ago with an 8mp camera. Pureview tech is cool but it sure has taken it's time. They are advances but they are not becoming mainstream. Really? 808/920 were in high demand the last time I checked. OTG USB is the way to go if the phone you purchase does not give you expandable storage. Expandable storage isn't a must for me. I back my phone up to my computer at least once a month, and use Motocast to access anything I want from wherever I am. With the way networking technology is going, removable storage will end up being a thing of the past. As long as there is at least 16 GB of on board memory, that's good enough for me. For those that need removable storage, networkdood brought up a good alternative for you. As far as the camera goes, I still use a regular digital camera for important things, and the phone camera for things on the fly. If this 13MP camera does what it says it does, this may eliminate the need for the separate camera. Good points - there are a ton of options out there now. Rather have a 64GB microSD card in the phone. I would still backup my data on the PC, or even purchase a separate external drive just for that. Low light needs to be the next big improvement without having the shutter speed so slow that taking any picture without flash causes blurryness.